2012 Kia Cee'd 1.6 CRDi 126 review | What Car? 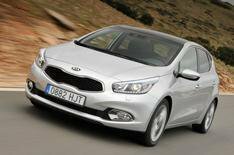 The Kia Cee'd was the car that elevated the Korean brand to a new level of desirability the UK. This second-generation model aims to take it to higher still. It's closely related to the new Hyundai i30, and shares much of the same technology. That extends to its 126bhp 1.6 diesel engine, which Kia expects will be the most popular in the range. Prices for this model start at 16,295, and rise to 23,595. Whats the 2012 Kia Cee'd like to drive? This engine deserves to be a popular choice, we'd say. It's not especially strong, but it's usefully flexible and exceptionally refined. There's a gentle thrum under acceleration, but at motorway speed barely a whisper. There's little wind noise, too, and a persistent level of road noise doesn't stop the Cee'd being a quiet cruiser. The handling is good, too, and although the steering a little slow to respond, the Cee'd is more fun to drive than an i30. The ride is firm, but not overly so. Whats the 2012 Kia Cee'd like inside? The Cee'd's cabin is solid, but lower-spec models are noticeably less plush than the pricier ones. Overall, the Hyundai i30's interior has a bit more sparkle and a VW Golf feels like a much more expensive car. The driving position is good, however, and there's enough space for five to sit in comfort. Anyone worried that Kia would see the launch of the new Cee'd as an excuse to bump up prices can rest easy value for money remains one of its key strengths. In entry-level 1 trim the 1.6 CRDi costs 16,295: that makes it cheaper and more powerful than most rivals. Add in a seven-year warranty and it's a very appealing package. At this price, the Cee'd's strongest competition comes from you guessed it the Hyundai i30 1.6 CRDi 110 Classic, which offers similar kit, but costs 500 more and has a version of the same engine, with less power (albeit no less torque). For now, it's too close to call. We'll have a definitive answer when we've tested the two cars back-to-back.